I think back to caregiving days and I often had to cheer myself on and cheer on Ben and my dad. Ben was actually great at motivating himself. 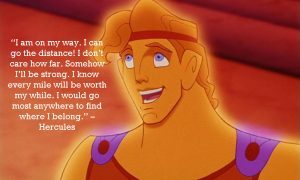 I can picture him singing this song from “Hercules” with a big smile on his face. I still have such great admiration for how he was inventive and determined to maintain as normal a life as possible despite the abilities ALS was stripping away. I was there to help him accomplish his goals, make him smile, and do for and with him what he could not do on his own. Although it was heartbreaking, and at times very tense, we did have a lot of laughs. But, he really did strive to go the distance, up until he left this world. I remain in awe of his bravery and strength. My dad was another story, spending seven years counting down to his impending demise. We joked about his negative attitude, but at times it did drain and frustrate me to the point of tears. I was his cheerleader, and I did enjoy hearing from him and from so many people that I was his life. I was a Daddy’s girl, and he was my life, too. My dad loved history, he was a very proud Marine, and he loved to read. I spent much time calling him from bookstores to read aloud book jacket descriptions of new books about World War II. It was hard to find books with an angle he did not know. When he asked a lot of questions but concluded by saying that I should not buy the book because, “where I’m going I won’t need books,” I knew I had a winner. Ben and I also found lots of World War II documentaries for my dad to watch, and he and I frequently watched one of his favorite films, “Mrs. Miniver.” I had to go the distance and be strong to find ways to give my dad strength and optimism. That was indeed a Herculean task! Managing grief has been another Herculean task. The ups and downs have been hard, but I cheer myself on, more successfully on some days than on others. I have definitely stepped back into the world of the living again. I am more comfortable in, or better resigned to, my routine of living alone, and I enjoy with less guilt the freedom to socialize again and to enjoy doing things I love, like going to the theater. I even added to my routine with strolls through Central Park, where I do see signs of Ben from time to time. I have changed things in my apartment, though Ben is very present here in photographs, things of his that give me comfort, and things of ours that bring good memories. When I think of the future, I still have to convince myself to go the distance. It’s not easy for me to perceive myself as strong, though intellectually, I know that I have shown physical and emotional resilience over the past several years. Managing grief is certainly a Herculean task. Each person will deal with grief differently. I’m glad you’ve managed to deal this rollercoaster of a journey, it’s nice to see that you are venturing out into the world again. I wish you all the best for the future! Thank you so much for your kindness. We all deal with grief so differently, and grief is so unpredictable. I appreciate your being a part of the dialogue!